On tonight’s show we had back our favorite yearly resident Jamie Thinnes of Seasons Recordings in studio. this time he brought in his beautiful mixer the Allen and Heath Xone V6. An all-star lineup of electronic musicians have come together to salute the sound and the vibe of one of the most influential and fun bands from the heyday of the southern California electronic music underground. 12 covers of classic tracks fuse new sounds and thoughts with familiar grooves and themes, resulting in an album like no other, and a loving tribute to a band that captivated audiences and fellow electronic musicians alike. Sklylab2000 made an indelible impression on the southern California electronic music scene, and brought their signature sound to fans around the globe. This album is a salute to their sound and spirit. 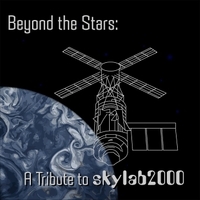 Twelve artists have come together to give their own new original versions of classic Skylab2000 tracks. Fans from back in the day will recognize the inspirations, and new listeners will be delighted by the dazzling compositions. There’s something here for nearly every electronic music fan. Join us in saluting one of the most influential electronic music acts from the southern California underground!